The bag is basically a substitute for a tent. The top of the bag inflates separately from the bottom. So the bottom is essentially a down filled air mattress. Unlike an air mattress there is some sort of special batting that prevents the down from shifting around. There are dual zippers that seal the bag very well from the wind. The bag uses Boston Valves and has a small nylon bag at the end of each valve that is used for inflating the sleeping bag. The bag is oversized so you can change clothes while you are in the bag. This is a real advantage when it is ice cold out and you don't want to get out of the bag until you are well protected. Because these bags don't breathe, you can't duck you head inside when it is cold. Instead, Pneugear supplied a separate hood that you wear to keep your head warm. I got my bag with all the bells and whistles and it includes a liner that can be used in extreme cold plus there is a small tent feature that you put on the top of the bag in rain along with a mosquito net that fits over the length of the bag if you are in an infested area and want to sleep on top. The bag is VERY comfortable. The only problems with the bag are: It is bulky. I backpack with it, but you have to use an external frame pack because you can't stuff the bag inside the pack itself. It has to be rolled and stowed externally. It is heavy - about 12 lbs for the bag and another pound if you bring the tent and mosquito net attachment. Also, you have to be careful when you are inflating in the rain so no moisture gets into the down. It takes about 10 minutes to inflate with the hand inflation bags and another 3-4 minutes for the tent attachment. Figure about 10 minutes to break it down and roll it up in the morning. The biggest problem: Pneugear went out of business back in 2002 - so the only place you're likely to see one of these is on E-bay. These bags take a quantum shift in thinking of sleep systems, but once you get used to it you will never want to part with it. I actually have two of these bags and have used them in some of the most god awful weather and will never go back to an ordinary sleeping bag again. First I think it is important for people to understand this sleeping bag was originally developed for NASA for a cost of $10 million dollars to resolve the cold and sleep problems encountered in space flight. Since they had the money and talent to think out of the box this bag is light years ahead of anthing out there, but to gain full advantage of the bag you have to learn how to use it. The first thing people notice is that this bag is more comfortable than your bed at home. With a down filled mattress below you by adjusting the air pressure you can make the lower section as hard or as soft as you want. The top section controls your sleeping temperature but as the pressure builds up it domes over you not even touching your chest. The neck collar gets a little getting used to, but once you get used to it but once you do you're fine. The next sensation you get is of the bag feeling like a steamy room, but that actually part of the design to minimize moisture loss to the human body. How you handle the issue is simply go to bed in thin long johns to remove the clammy feel and you're fine. Where this bag really shows its stuff is if you ever do a long winter trip. If you have ever done one you will find out that the biggest problem you have is moisture from your sweat building up in your sleeping bag insulation and freezing. 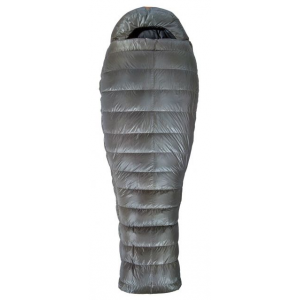 With this bag it's impossible to get the insulation wet thus you stay warm irregardless and with the insulated mattress below you sleeping on frozen or wet ground. Some of my greatest memories with these bags though invove back country skiing in the Sierras where my girlfriend and I on a crystal clear January night cut out a pad to sleep on and just climbed into them for the night. Right there at 10,000 feet. Mid winter, In the snow. We were toastie warm in sub zero cold on a starry night. This bag requires an entire shift in your way of thinking. This bag requires an entire shift in your way of thinking. It is waterproof and does not breathe. You stay dry because you start sleeping with the top at its thinnest setting and increase it if you become cold. I have stayed warm to 10 degrees with the top but an inch thick. It adjusts to three inches or more. Your head will get cold (this mummy has no hood) so you MUST take a thick fleece or quilted hat with you. On the other hand, I have slept at 102 humid degrees in Baja by using the bottom only, bug screen in place, and slept in a silk bag liner. Wierd Huh? I did fall off a ledge in this bag, dropping 6 feet onto some EXTREMELY sharp rocks. Down flew everywhere. It is really good down, I would say 700 fill or better. I stuffed all I could back inside...used the on-board patch kit to repair the two tears...shifetd the down around a bit to insure there was no insulation "void" in the bottom and presto...I have been using it for another 8 months no problem. I have no doubt that had the rocks been any less sharp, it would not have required patching. I believe I could use this unit as a raft in case of a flash flood during slot canyon hiking. I own a Cocoon 4 Extreme, made by Pneugear (www.pneugear.com). I own a Cocoon 4 Extreme, made by Pneugear (www.pneugear.com). The company's ads claim it is comfortable from 45 degrees below zero to 70 above, that it is TOTALLY WATERPROOF, and that it is comfortable on bumpy ground. So far I can vouch for two out of three of those claims. It sure is waterproof - I got inside during a driving rain with my clothes really wet. I took off my jacket inside, and pushed it down into the toe area, and did the same with my pants. My shirt and long johns were also wet, but I kept them on anyway. A few minutes later, I couldn't feel the wet clothing, and in 20 minutes I was asleep. I woke up next morning warm and dry, and my jacket and pants were only damp. Pneugear claims that moisture is absorbed by the skin, and since it can't get into the down insulation, the sleeping bag stays completely warm. It rained most of the night, but I was warm and dry, even though my head was only covered by the tent (they call it a canopy) they supply. I've used the Cocoon 4 on pretty rough ground, and I've never felt any of it. The down filled mattress is over 4" thick, so it can absorb a pretty big rock without it sticking into you. I don't put anything under it, since you can clean it with a hose or a washcloth. 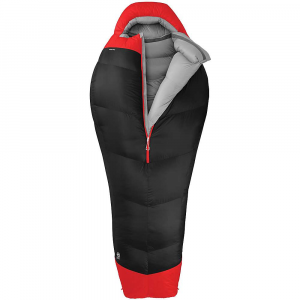 The Cocoon sleeping bag is inflatable - it comes with a really simple inflator sack which blows it up in about 5 minutes. This inflation controls the thickness of the down insulation. When it is warm out, you leave the blanket deflated, so it stays cool. If it gets cold out, you pump more air into the blanket, which makes the down thicker and warmer. I've slept out at temperatures as high as 65 degrees and as low as about zero. At that lower temperature, I only had to half inflate the blanket to keep really warm, and so my guess is that it probably could go to 45 below. You definitely need the neat hood that comes with it, though. The cocoon is roomy inside. I am 6' and weigh 260, and I can change my clothes inside. 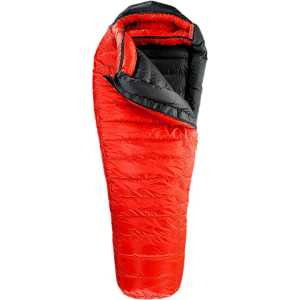 When the Cocoon is rolled up, it is only 11" in diameter by 17" long, so it fits in the sleeping bag pocket of my Lowe pack. 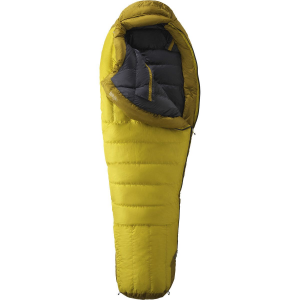 It weighs only 10 pounds, so that it is smaller and lighter than my regular sleeping bag, ground pad and tent. The Cocoon 4 is definitely the most comfortable sleep I've ever had outdoors. In fact maybe even indoors. 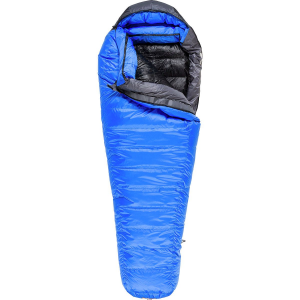 The company claims it is the world's best sleeping bag, and I can't argue with that. The Cocoon 4 has been discontinued. The Pneugear Cocoon 4 is not available from the stores we monitor.